I have been seeing the art of Rachel Lewandowski pop up in my Instagram and Facebook feeds for awhile now and I am always struck by the power and attitude inherent in her fascinating, abstract creations. I was eager to interview Rachel and learn more about the story behind her paintings and her process and she did not disappoint. Enjoy! Rachel: This is a favorite of mine that I will probably never part with. A single raven soaring through the clouds. I love how the color blending worked out. Rachel: Only 6 words is hard. My best answer would probably be "Abstract art inspired by the elements". Rachel: I can't say that I have a favorite artist. I love the aesthetic of Aiden Hughes, who does almost propaganda-style posters and prints. I've recently fallen in love with the work of Brian Kirhagis, whom I discovered on Instagram last year. He does a sort of abstract portrait...it's difficult to describe, but it truly gives an emotional reaction. Rachel: Also a favorite of mine. 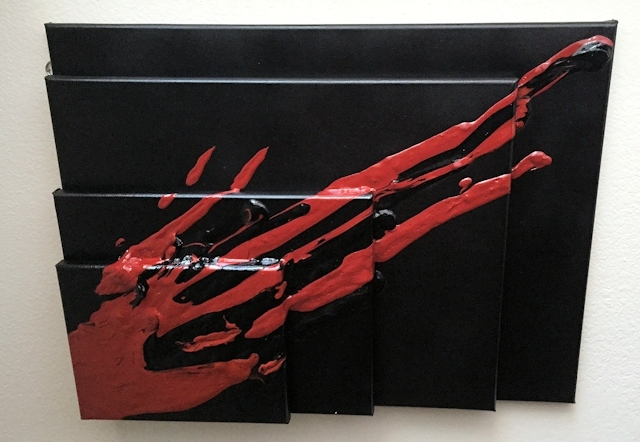 4 canvases stacked together (I used a staple gun and Gorilla Glue to make that happen), with diluted acrylic paint cascading over the layers. Modern yet not. Definitely eye-catching on a wall. 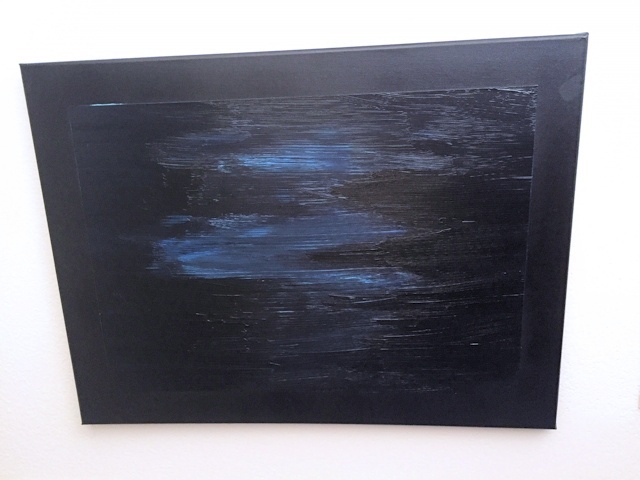 Rachel: I draw inspiration from so many things...I have a fascination with the Northern Lights, how colors seem to blend in the sky, highlights and lowlights seamlessly flowing in and out. The patterns found in crystals and gemstones always capture my attention. The way that light will catch on a fissure in the stone, bringing a flash of brilliant color that was otherwise hidden. I did what I called my 'Music Box Collection' last year, which were my visual interpretations of songs that had stayed with me. There is beauty everywhere, but we need to be open to seeing it. Rachel: A recent completion. I love all shades of blue...how even the most subtle shift in shade can completely change the dimensions. This is one of the more demure pieces I've done lately. I like the idea of how layers of paint can catch the light, creating hidden images that not everyone sees. I find it very inspiring that different perspectives can see completely different things. 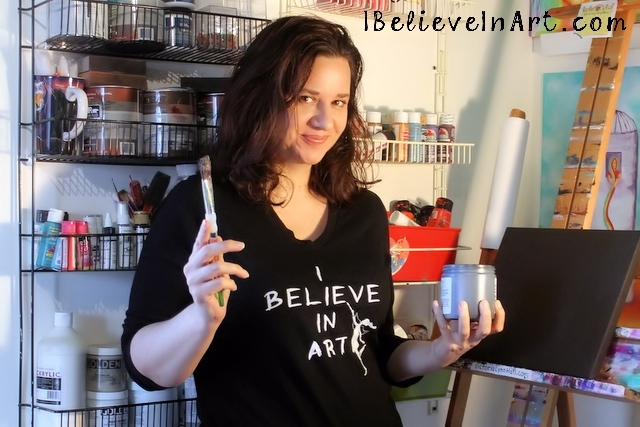 Rachel: My favorite part of the creative process is sitting down with a blank canvas and arranging my work space. Sometimes I have a clear image of what I'm trying to achieve, and other times I just let the paint flow. Literally. Rachel: This was a piece that I gifted to a dear friend. 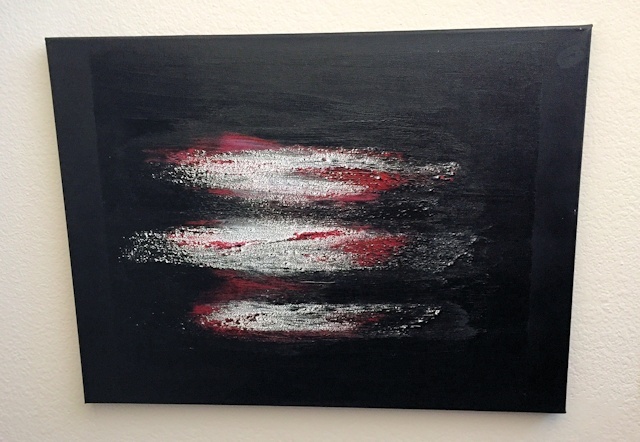 Black canvas, white, red and black acrylic. I discovered the wonder of sand gel late last year, and I used it to excess. I wanted everything to have that gritty texture. This was one of the few that turned out the way I wanted it to. Rachel: The most challenging part for me is knowing when to stop. Knowing when a piece is actually complete or whether it needs "just one more tweak". I've left paintings to sit propped against a wall for days, so I can continue to look at it until I'm satisfied. This has, of course, led to more than a few 'do overs', but it's the method of my madness, so to speak. If I don't want to hang it on my own wall, it's not done. Rachel: This is the second piece I did for the mosaic collection I started this year. 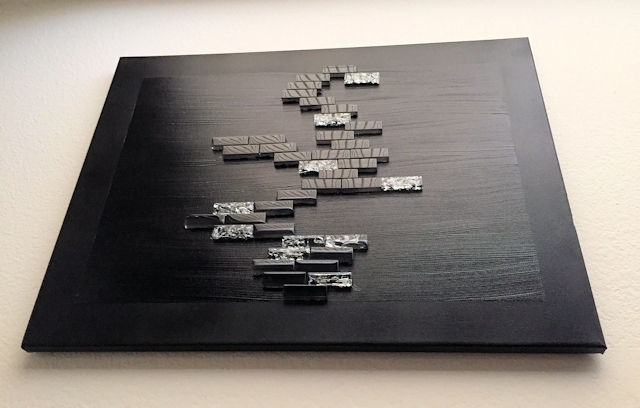 Black canvas, black acrylic paint, and black tiles accented with a few shimmering clear ones. Simple, modern, clean. I was so proud of this beauty. 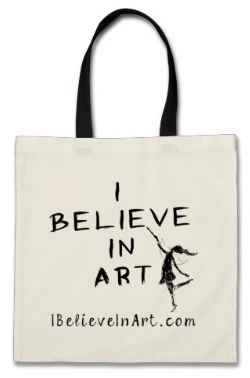 Rachel: "Believing in Art", in its simplest form, is wanting to continue creating. I love putting paint to canvas. I love the satisfaction that comes when other people see beauty in what I've done. It makes me feel a little less alone in what I find pleasing to the eye. 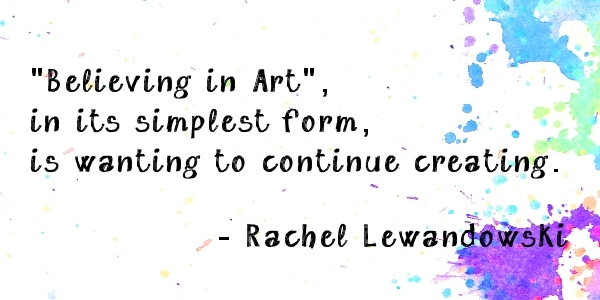 Thank you Rachel for this insightful look at your artistic journey. 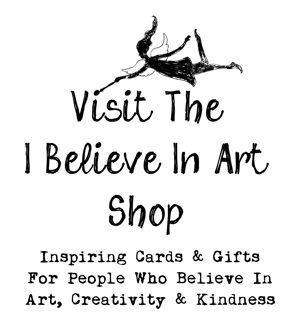 Rachel's paintings are available through her Etsy shop. 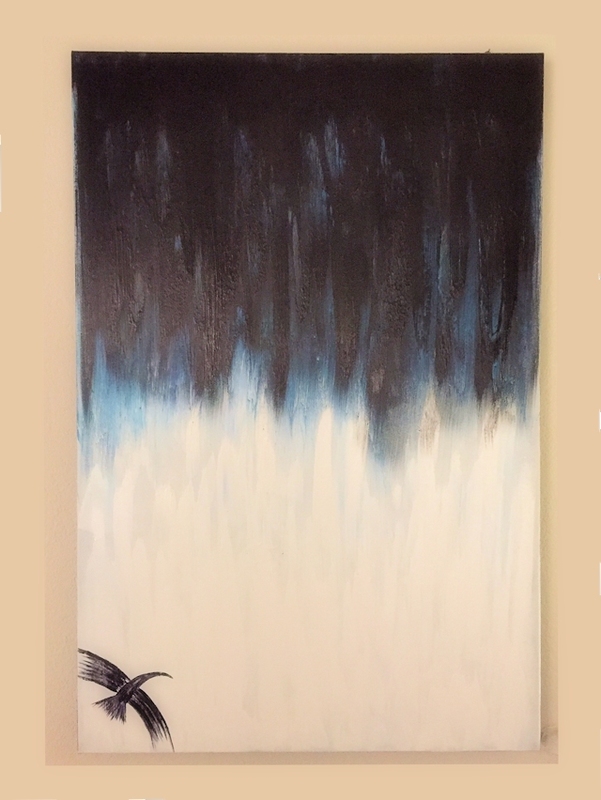 I can understand why Rachel may not part with her raven soaring through the clouds...love that one! Perhaps considering prints and/or notecards, while keeping the original?